Skexis - "Hsssss… pathetic mortals. My claws will make your flesh dance." Skexis - "At last, we reveal ourselves to this realm. Let me show you the terrors of the Abyss." Source: Evolve Skexis Fiend at Level 4. 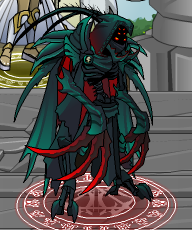 Note: Also see Skexis Mantis. Thanks to Excavator2 and The Jop.